Teaching The Rules Of War In Syria's Vicious Conflict : Parallels War crimes are increasingly defining the conflict in Syria. But a recent workshop for opposition fighters held in southern Turkey hopes to teach them international humanitarian law that helps them be "Fighters Not Killers." 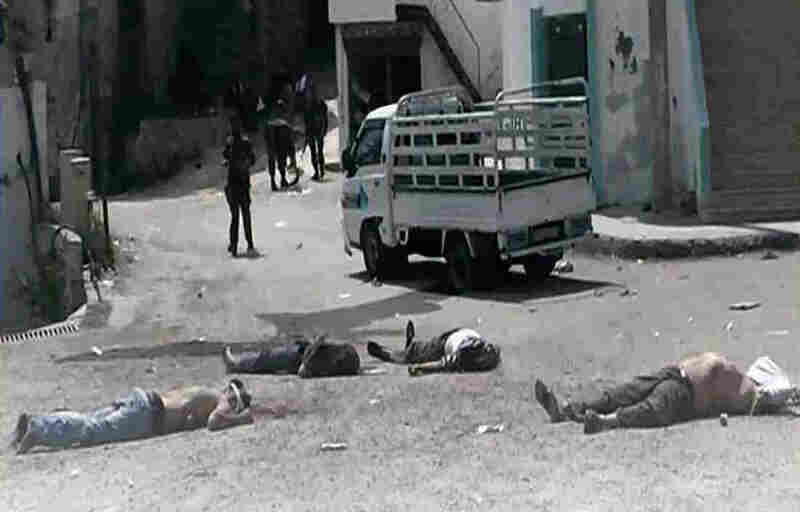 This image provided by the Syrian Revolution against Bashar Assad and released May 2 shows soldiers loyal to Syrian President Bashar Assad standing amid dead bodies at Bayda village, in the mountains outside the coastal city of Banias, Syria. A new video from Syria is shocking even by the standards of a war that keeps setting new standards for brutality. In the video, a rebel fighter identified as Khalid al-Hamad is shown cutting out and eating the organs of a dead government soldier. This appeared shortly after a pro-regime militia filmed the aftermath of a massacre of Sunni villagers in the coastal town of Banias, in which at least 62 people, including babies, were stabbed or shot to death. War crimes are increasingly defining the Syrian conflict, where cellphone cameras are as prevalent on the battlefield as weapons and competing images of savage events are uploaded to the Internet to spread hatred and fear. A Swiss-based group, Geneva Call, is hoping that a course in international humanitarian law can mitigate some of the offenses. A recent workshop in Gaziantep, in southern Turkey, introduced Syrian opposition fighters to the international laws of warfare. Osama Abu Zaid, a Syrian activist, organized the workshop on behalf of Geneva Call. "They are hungry and eager for knowledge," Zaid says of the rebels, whose ranks include government military officers who defected. Some of the opposition fighters left the battlefield in Syria for the workshop in a Turkish hotel. "They now realize they have done some things wrong," he says. "Fighters Not Killers" is the name of the two-day course that focuses on 15 principles of the Geneva Conventions that codify the rules of war. The participants work on case studies that encourage them to link classroom exercise to their experiences in the Syrian civil war. "They are learning the rules," Zaid says as small groups go through the exercises. "For example, when the enemy is surrounded, they don't have the right to shoot him, but must arrest him." Zakaria Haj Hussein is a police officer from Latakia who defected and joined the rebels. "We came here to know international law and not to make the mistake of a war crime," he says. Hussein says he never had this training in Syria. As a policeman, he explains, the law says that officers are to protect civilians. But Syrian officials made clear, he says, that "we could do whatever we wanted" when it came to arrests. In a separate corner of the hotel, a group of rebels from the eastern province of Deir Ezzor is wrestling with another case study. A rebel commander reads the exercise to his group: "The Red Cross guy responsible for medical aid comes to our headquarters to complain. He is worried that we are using an ambulance to transport weapons. Why is he worried?" The young rebels offer different opinions. "Because we are using it for military stuff," says one. "Because he's afraid the enemy will hit it?" says another. The group leader waits for discussion to wind down before he weighs in. "This is a bad job, it's a war crime," he says and then adds, "if the enemy knows we use an ambulance to deliver weapons, then he will shoot at all the ambulances." It is impossible to calculate the impact of a short course in the rules of war on a conflict that has brutalized Syria and become increasingly sectarian. The trainer, a specialist in international law, asked that we not use his name. He has conducted workshops in other conflict zones and says "the knowledge" can make a difference. "There is an impact on the ground. You see public statements change. You see the types of weapons change," he says. He knows the training has changed attitudes on the battlefield when he gets complaints from commanders who say that when the orders come to launch a rocket, "his men want to know, where?" And when combatants start to carry maps and buy GPS devices to make sure they are hitting enemy soldiers not civilians, he knows the training has taken hold.